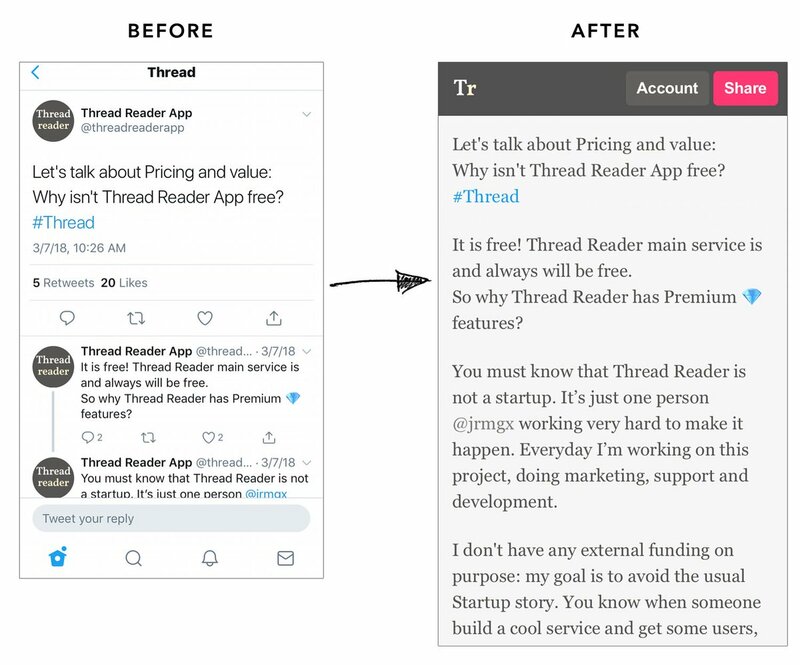 Thread by @threadreaderapp: "Several users have requested we prevent redundant unrolls for popular threads e.g. We want to help solve this! 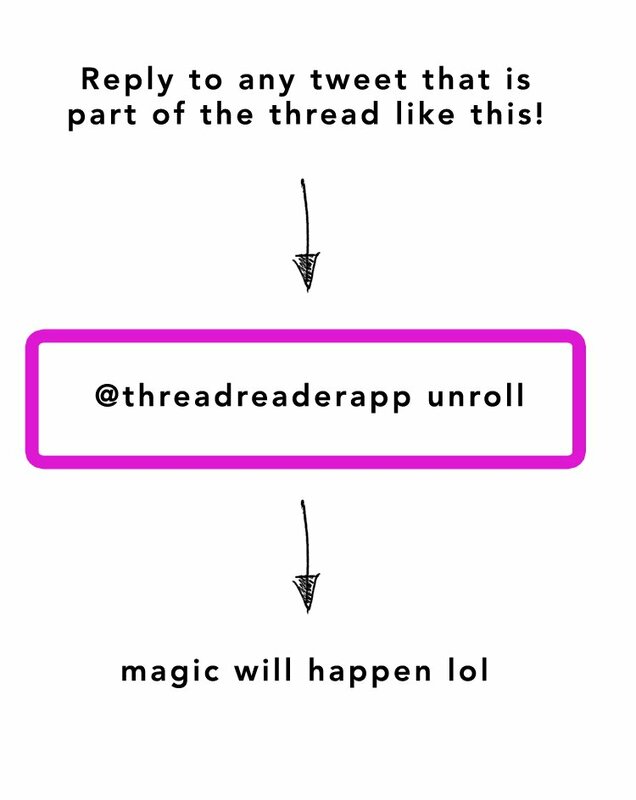 But a big problem is Twitter […]"
Several users have requested we prevent redundant unrolls for popular threads e.g. We want to help solve this! But a big problem is Twitter shows different replies in different order for different users! Here is an example of how the replies looked different on two different accounts on the same thread! 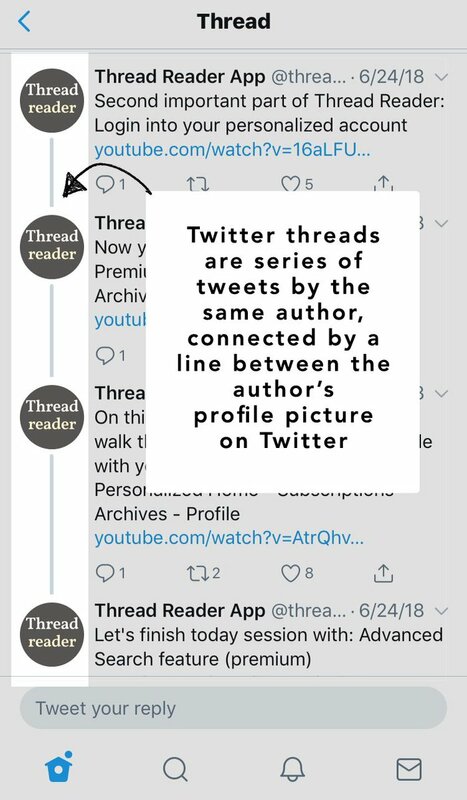 Of course, if you like a thread that has not been unrolled, unroll and like 'em so that others can Like and Retweet and make more prominent. Hope this helps and thanks again for all your feedback and suggestions! We are upgrading migrating a server right now. Should be pretty seamless but fingers crossed! and we're rolling again! thanks for all the well wishes! New to unrolling threads? Not sure how it works? You can practice here! Simply mention our name with the keyword "unroll" to any of the tweets in this thread so you can see how unrolling works! Our bot 🤖 unrolls these Twitter threads in a blog format so it's easier to read the whole story without any noise! Pretty cool right? 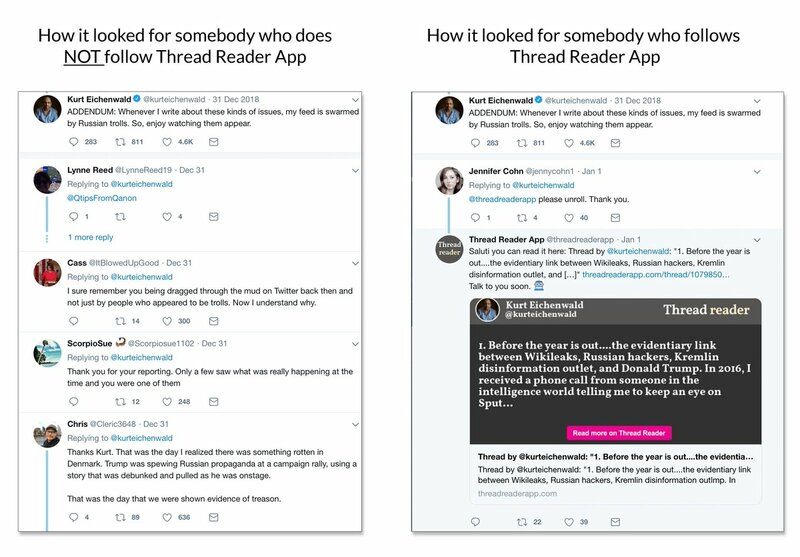 Today let's take some time to learn more how to use Thread Reader. I've made a series of video tutorials for you. (THREAD) After 30 years of testing as Lawful Good, today I came up Lawful Neutral for the first time. I suspect it's because—at 41—I'm learning that those who elevate their subjective view of what is good over the continued existence of a lawful society can collapse that society. 2/ I don't have any doubt Trump is Chaotic Evil. (Many educated people out there who—like me—don't play D&D nevertheless see that game's moral framework as a useful starting point for discussion). And I think all those working for him are *deliberately* working on behalf of evil. 3/ If I'm Lawful Neutral, I'm as likely to oppose someone who is Chaotic Evil as anyone is—a Chaotic Evil villain like Trump doesn't believe in the rule of law and perpetuates a lawless environment in which evil (and not any sort of peaceful, just, tolerant balance) is ascendant. I know a number of people who have gotten jobs on LinkedIn, a number of recruiters who use LinkedIn as their major recruiting platform and more importantly I have been offered jobs and business opportunities on LinkedIn. It is a good platform if you can wield it. I’ll like to divide the “How” into 4 parts. 1/ Highlights on the State of Cryptocurrency Investing from the #ConsensusInvest conference. 2/ All errors and omissions are mine, not speakers. This is a daily thread on some 31 ways to keep our use of English simple, short and meaningful. We will expound 1 way per day for the next 31 days. Questions can be raised here or via DM. Pls RT & stay tuned. Way 01- Choose the easy path! Actually, anything worth doing is potentially hard. Simple sentences, however, are less problematic because of their simple structures. Familiarize yourself with and use them often. The simple sentence could contain both obligatory (VERB) and optional (SUBJECT, OBJECT or COMPLEMENT) elements. These are very important aspects!